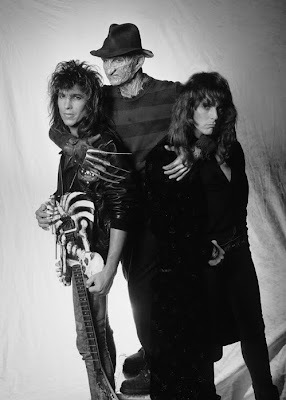 Basement of Ghoulish Decadence: Can Freddy and Dokken Help End This Long Week? I wouldn't say it's the worst week ever, but since I got a lot of time off last week, this whole week has dragged. I've got a bunch of days off through the holidays and I can't freakin' wait! I can't say that Freddy and/or Dokken will be a part of it, but there will certainly be lots of horror movies watched and beers drank. Perhaps I'll throw on some of the ol' heavy metal for good measure. Dokken should have given you a sweet freddy shirt. Then, and only, I would have been jealous. and no one brought me a coffee! If Dokken gave me a sweet Freddy shirt I would wash it before I wore it... because it's probably dusty and dank... because it's from the 80's and old... just like Dokken.